Luck is the order of the day with Streak of Luck, a 5 reel, 50 payline online slot powered by Playtech. Incorporating some of the world's most traditional symbols of luck, this game surely fits right in with the entire concept of gambling. The reels are set against a luscious leather background to add some pizzazz to your experience, while an interesting bonus feature and a progressive jackpot ups the ante in terms of winning opportunities. Play Streak of Luck for free or for real money at your favorite Playtech casino today. Streak of Luck is packed with sensational winning opportunities thanks to a variety of bonus features and a progressive jackpot that could award the latest millionaire at any moment. What's more, two random wilds will be added to each spin, while three will be added if you get nine consecutive wins. A tenth consecutive win will earn you the progressive jackpot and the total is dependent on your stake, therefore the more you bet, the more you may potentially win. The bonus is triggered by landing dice symbols on the first, third and fifth reels. You will be taken to a game where you roll those dices three times to win prizes. The dice are then totalled and your total stake is multiplied by that amount. Any extra wins are awarded as well. 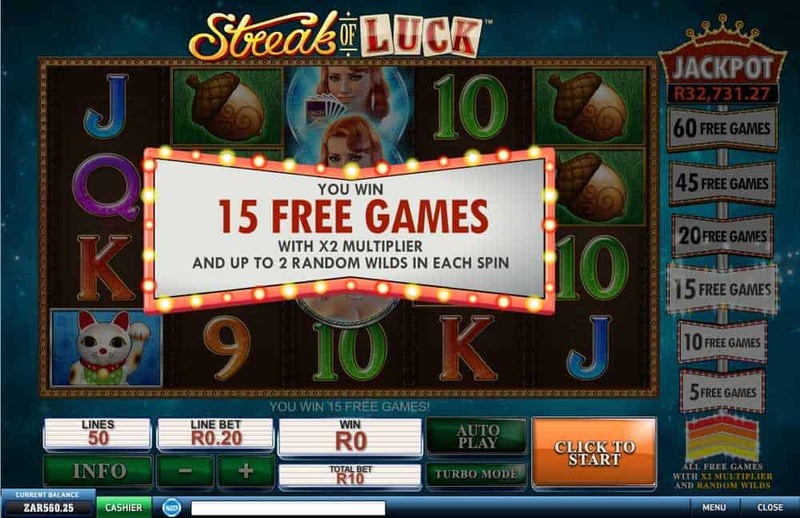 Streak of Luck is a five reel, 50 payline online slot that is designed to be simple, straightforward and rewarding. The high value symbols are theme-appropriate and include classic 'luck' symbols like a four-leaf clover, an acorn, a horseshoe, a Chinese dollar, a ladybird, and a waving cat while lower paying symbols are card values 9, 10, J, Q, K, and A. Special symbols are the playing car scatter, the wild and the dice bonus. Before playing the game, you must adjust your bets. The Line Bet will let you change the coin size, which ranges from 0.01 to 0.40. There is also an Auto Play option that allows the reelsto automatically without interruption and a Turbo Mode that speeds up the reels. Once you are ready to play, you can press Spin and the reels will be set in motion. Wild symbols replace all symbols except the scatter and bonus. Win up to 60 free spins and stand a chance to trigger progressive jackpot. 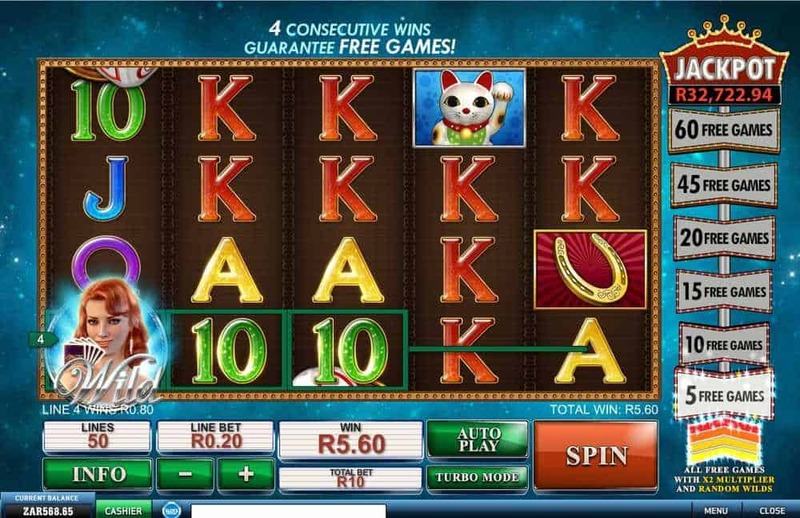 Streak of Luck is the perfect game for those looking to strike it lucky while playing an online slot game. Powered by Playtech, this game has plenty of exciting thrills and spills that all culminate to some impressive wins plus the chance to trigger that all-important progressive jackpot. With an RTP of 94.99%, this medium to high variance game will have to playing to win for hours on end.